A microwave oven is a kitchen appliance which works using the microwave technology. It bombards the food with electromagnetic radiation in microwave frequencies which causes thermal build up within the food molecules. 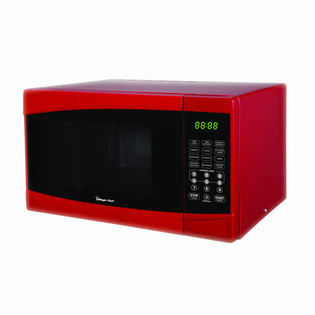 The Emerson microwave oven offers a capacity of 0.9 cu. Ft. It has 10 different power levels for flexibility of choosing the required heat setting. For evenness in food items it offers a built in rotating turn table which rotates as long as the oven is heating allowing consistency of heat throughout the food item. 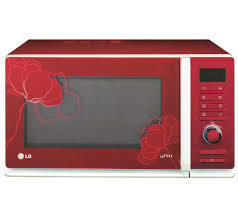 Plus this is a 900-watt microwave oven so energy consumption is pretty less. It has 8 touch buttons that allow customization of cooking to suit the recipe. The defrost function allows heating back of frozen or pre cooled food items for the complicated recipes. This microwave also has a child lock for parental control. And best of all it looks great in RED. 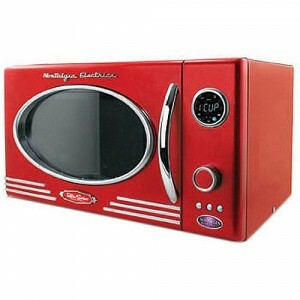 This one of a kind oven is made imitating the retro microwave ovens. With all the features of modern technology suppressed, this oven has minimal functioning and look really of the 90’s. Its key features are its 90 cubic feet capacity and retro styling with chrome accents. 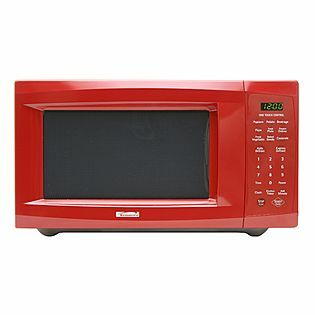 With a timer and an LED display clock it simply is the most basic microwave oven but as far as look are concerned it will remind one of the retro ages and it simply looks cool in RED. Again taking us on the retro ride is the magic chef microwave oven which is inspired by an old design but not too far from recent times. 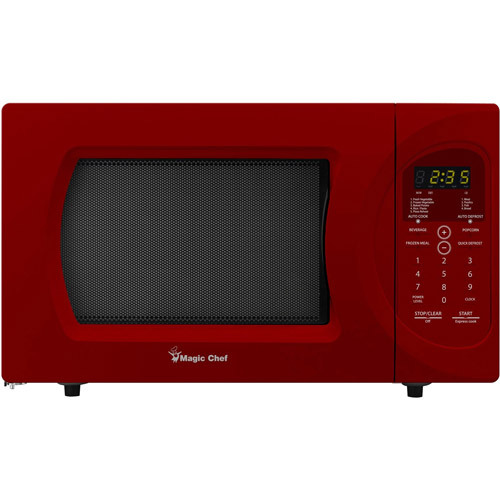 This is another small microwave oven available at a very cheap price and has the look of an ideally simple microwave oven. Measuring a capacity of 0.9 cubic feet, this microwave consumes 900 watts of power and has many key features such as preset defrost setting for fish meat and poultry items, 5 preprogrammed auto cook menus have also been facilitated to be available at one touch. Along with these programmed options to cook popcorn, frozen pizza and frozen meals is present. Other than all this 10 power levels to choose from provide efficient results. Best of all it also comes in RED. Magic chef also offers another of its models a very stylish model with all the sleekness and elegance retained making it not too flashy nor to sober, just the right amount of RED. This model comes with 10 power levels a few auto cook menus and all this in 0.9 cu. ft.
With a power rating of 900 watts and an additional feature of digital touch, it could lure anyone. This microwave is just like all the above mentioned but yet it’s got enough read to add chic to the entire kitchen. Capacity 1.1 cu. 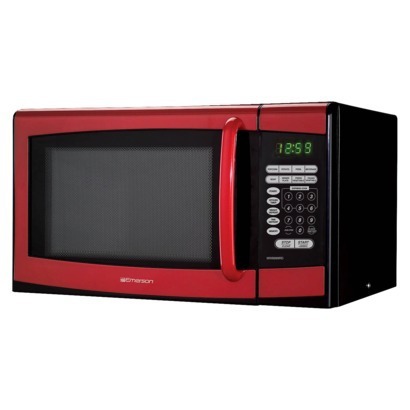 Ft.The Kenmore Countertop Microwave is the hot little sports car of the kitchen when done in a bright and shiny red tone. Its power rating is 1200 watts. Which makes it even more desirable.